Meghna and Ajay will present remotely. 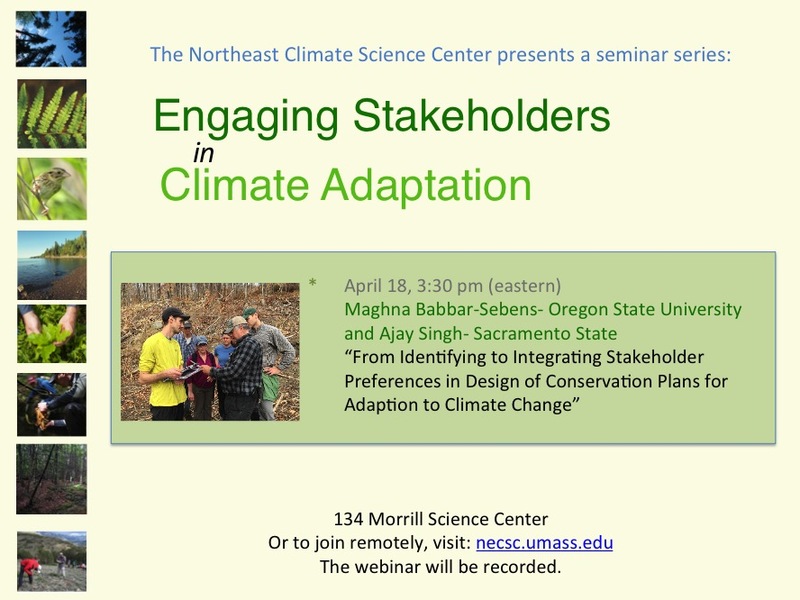 If you are on the UMass Amherst campus, please join us in Morrill Science Center II, Room 134. To join the webinar online, follow the link above. Webinar ID: 760-353-861. This webinar does not require a password or registration. Participation is on a first-come, first-served basis. 2) To join the audio, choose either internet audio (with good bandwidth) OR call (646) 876-9923 or (669) 900-6833 or (408) 638 0968 followed by the meeting number, 760-353-861. Abstract: Across the Mississippi River Basin, some of the most compelling and widespread conservation challenges are focused on reducing nutrient runoff from agricultural lands, which contributes to Gulf hypoxia, while also enhancing habitat for species of management concern, especially grassland and riparian bird species. The NE CSC-funded project, “Incorporating Understanding of Social Drivers that Influence Implementation of Conservation Practices that Improve Water Quality and Wildlife Habitat,” was completed in collaboration with the USGS, Landscape Conservation Cooperatives and universities. The team developed a decision support tool to identify areas where strategic implementation of select conservation practices in specific watersheds will improve both water quality and avian habitat. Recognizing that landowner participation and support is critical for conservation practices to be successful, team members conducted a suite of detailed landowner surveys to enhance our understanding of landowner preferences and motivation for implementing specific conservation practices on the ground. Results of this research will lead to an enhanced understanding of how landowners and managers shape adaptation and resilient livelihoods beyond climate risks and, ultimately, how to better address Gulf hypoxia and declining wildlife populations as impacted by extreme climate events. Dr. Babbar-Sebens is an Associate Professor of Water Resources Engineering in the School of Civil and Construction Engineering at Oregon State University. She is also the co-director of OSU-Benton County Green Stormwater Infrastructure (OGSIR) Facility, an Oregon BEST Lab. Dr. Babbar-Sebens’ research interests lie in the area of Water Resources and Environmental Systems Analysis. She and her students conduct interdisciplinary research in the field of Hydroinformatics to develop innovative and effective monitoring, simulation-optimization, and decision support technologies for sustainable planning and management of water-based systems, including watershed systems, stormwater infrastructure, and systems at the nexus of food, energy, and water sectors. Dr. Singh is in the Department of Environmental Sudies at Sacramento State. He has expertise in qualitative social research and social policy.